In case you forgot about the historically massive Sony Pictures hack last week, a group of hackers just reminded the world that they exist and remain angry. In a new post, hackers identifying themselves as "the GOP working all over the world" leaked data that they claim came from Sony's servers. Their demand? Pull The Interview or else. 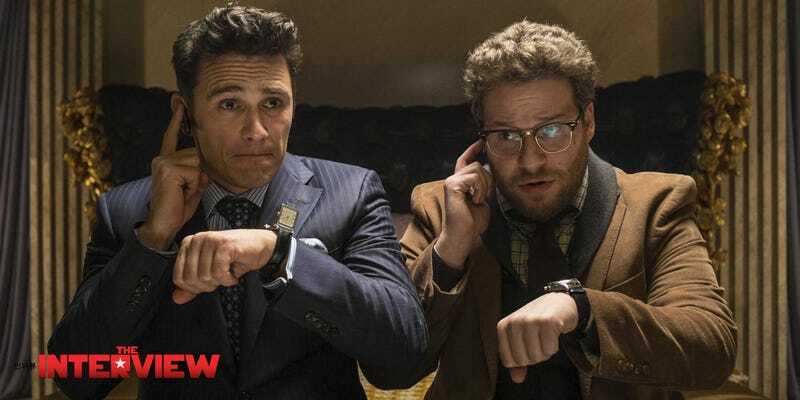 The Interview, of course, is the new Sony Pictures movie starring Seth Rogen and James Franco about assassinating Kim Jong-Un. (GOP, by the way, stands for "Guardians of Peace.") This latest message, if it's even from the original Sony Pictures hackers, would support the idea that the group is in fact North Koreans angry about a movie that celebrates the death of their Supreme Leader. It's more complicated than that, though. North Korea has now said—more than once—that it did not hack Sony Pictures. And while there's some evidence that that the attack has origins somewhere in the Koreas, there's also evidence that the hack itself took place in a Bangkok hotel. There's also some confusion over who's doing the GOP posting now, since Monday's GOP post says the GOP email from Friday threatening Sony Pictures employees' and their families did not come from the real GOP. We have already given our clear demand to the management team of SONY, however, they have refused to accept. It seems that you think everything will be well, if you find out the attacker, while no reacting to our demand. We are sending you our warning again. Do carry out our demand if you want to escape us. And, Stop immediately showing the movie of terrorism which can break the regional peace and cause the War!